In this new fan shot video from the set of The Dark Knight Rises, Anne Hathaway is doing her own stunts as Catwoman. Hathaway is riding a Batpod motorcycle and looking pretty adept at riding the machine on the Pittsburgh set of The Dark Knight Rises. 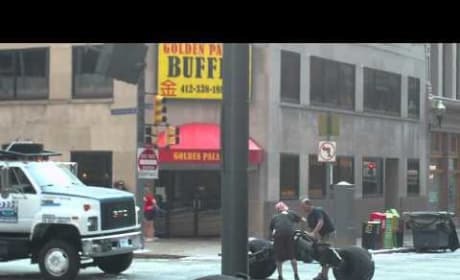 The Dark Knight Rises continued filming in Pittsburgh over and gave fans its first look at Anne Hathaway's Catwoman in action.